Description: Air Force Capt. Jerauld Gentry, shown in this photo with the M2-F2, made a total of 30 lifting-body flights in 5 different vehicles--the M2-F1 (2 flights), M2-F2 (5 flights), M2-F3 (1 flight), HL-10 (9 flights), and X-24A (13 flights). 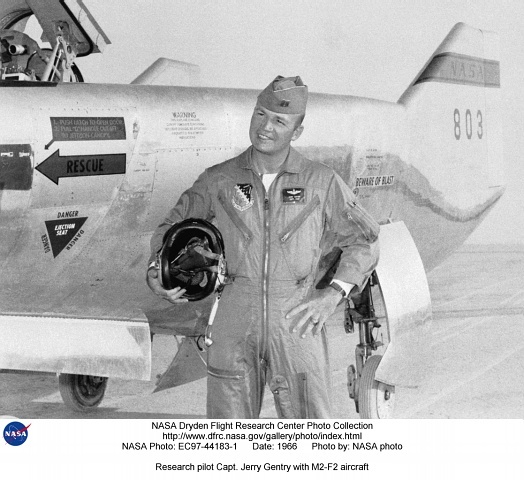 While 3 other pilots had more total flights (Milt Thompson with 51, John Manke with 42, and Bill Dana with 31), Gentry was the only lifting-body pilot to fly 5 different vehicles in the program. Description: A fleet of lifting bodies flown at the NASA Dryden Flight Research Center, Edwards, California, from 1963 to 1975 demonstrated the ability of pilots to maneuver and safely land a wingless vehicle designed to fly back to Earth from space and be landed like an aircraft at a pre-determined site. Aerodynamic lift--essential to flight in the atmosphere--was obtained from the shape of their bodies. The addition of fins and control surfaces allowed the pilots to stabilize and control the vehicles and regulate their flight paths. The information the lifting body program generated contributed to the data base that led to development of today's space shuttle program. The success of Dryden's M2-F1 program led to NASA's development and construction of two heavyweight lifting bodies based on studies at NASA's Ames and Langley research centers--the M2-F2 and the HL-10, both built by the Northrop Corporation. The "M" refers to "manned" and "F" refers to "flight" version. "HL" comes from "horizontal landing" and 10 is for the tenth lifting body model to be investigated by Langley. The first flight of the M2-F2--which looked much like the "F1"--was on July 12, 1966. Milt Thompson was the pilot. By then, the same B-52s used to air launch the famed X-15 rocket research aircraft were modified to also carry the lifting bodies. Thompson was dropped from the B-52's wing pylon mount at an altitude of 45,000 feet on that maiden glide flight. The M2-F2 weighed 4,620 pounds, was 22 feet long, and had a width of about 10 feet. On May 10, 1967, during the sixteenth glide flight leading up to powered flight, a landing accident severely damaged the vehicle and seriously injured the NASA pilot, Bruce Peterson. NASA pilots and researchers realized the M2-F2 had lateral control problems, even though it had a stability augmentation (control) system. When the M2-F2 was rebuilt at Dryden and redesignated the M2-F3, it was modified with an additional third vertical fin--centered between the tip fins--to improve control characteristics. The M2-F2/F3 was the first of the heavy-weight, entry-configuration (i.e., configured for re-entry to the atmosphere from space) lifting bodies. Its successful development as a research test vehicle answered many of the generic questions about these vehicles. NASA donated the M2-F3 vehicle to the Smithsonian Institute in December 1973. It is currently hanging in the Air and Space Museum along with the X-15 aircraft number 1, which was its hangar partner at Dryden from 1965 to 1969. Keywords: M2-F2; Lifting Body; re-entry; Milt Thompson; Bruce Peterson; Jerauld Gentry; Bill Dana; John Manke; M2-F1; M2-F3; heavy-weight; Smithsonian Institution; National Air and Space Museum.